So, the weekend before last, I happened to catch the third Harry Potter movie on cable and really had fun watching it. So, we borrowed all the Harry potter movies from a friend of mine here at work and watched the first two this weekend. There are some really cool things about Harry Potter that you wish really existed like paintings that move and newspapers that are bewitched and animated. I thought that the scene when they ate the candy that made them sound like animals was really cool. Well, we happened to see these little jewels at Books-A-Million yesterday and thought it'd be fun. We are really big into making our dinner or snacks for the evening match our entertainment (for instance pasta is always good when we watch The Sopranos). Anyways, I really thought that the gross-out flavors would be a joke. But noooooooooo! After 1 soap flavored jelly bean and 1 bacon flavored jelly bean I really thought I was going to hurl. That combonation was TERRIBLE. After that I tried dirt & grass. Isn't it odd how everyone knows how dirt & grass should taste even though we don't go around eating dirt & grass all the time? I couldn't (and won't) bring myself to try the rest. Patrick went on to try more, but soon become a little green around the gills. He said the sardine flavored one was really amazingly dead-on. Here is the flavor guide - do you think you could handle it? i can't decide which one sounds worse - earthworm or vomit. I had a former student (who now is in charge of things that explode with the Navy) buy some of the Hairy Potter jelly beans and put them in an empty bag of Jelly Belly's. People were all but hurling. Eww!! Booger and earwax?! Gross!!! I did have the butter popcorn flavor before and despite the fact that I love buttered popcorn, I instantly felt sick. Blech. Some food products are just a bad idea. Like that turkey flavored Jones soda. Ick. I've never liked jelly beans. I'm just imagining the taste tester in the factory saying,"Yes,that's it, it tastes like Booger". 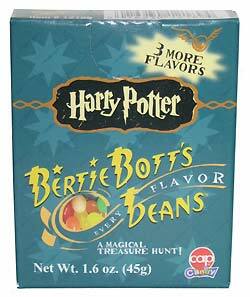 When reading or watching HP, the Jelly Beans were always something I couldn't figure out. I was never tempted to get any when I saw them for sale. Maybe it's a boy thing? Janet - you are right. 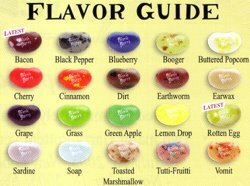 I think the most disturbing things is that someone had to sit around and describe booger and earwax and then actually confirm the flavor. You couldn't pay me enough for that job. And for the record, my favorite jelly belly bean is Buttered Popcorn. I don't know why, but I love them. And Juicy Pear comes in at a distant second. I've never had caramel corn! I saw that flavor yesterday on their site. Did you know they make a flavor called "buttered toast"? That is strange, but I guess not much stranger than popcorn. Everytime I mention the buttered popcorn ones I get a craving, dangit! i have a theory that you can take two perfectly good foods and when you put them together you get something totally gross. the example i use to demonstrate this is the "ham donut." Dave Attell said the same thing once. He said that he liked cotton candy, and that he liked whisky. If you add the two flavors together, you smell like you boinked a clown. ick....earwax? vomit? i wonder whose job it is to taste test for quality control! I tried all the flavors, I was able to keep them all down except Earthworm flavor...I threw up right after I started chewing, it's THE most disgusting thing I've ever eaten.